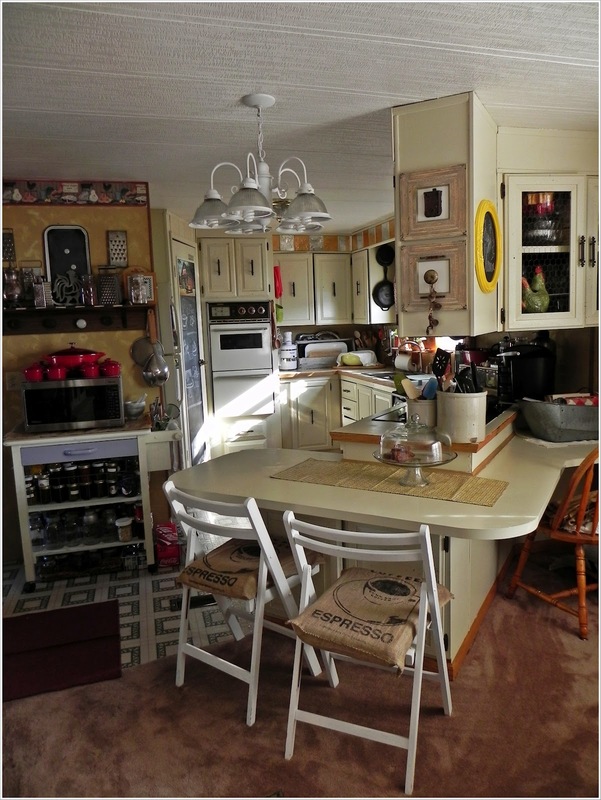 This double wide makeover is what MMHL is all about. Shannon Olson, the publisher of Southern Belle with Northern Roots, is an amazingly talented woman. She calls a 1979 double wide home and has transformed it into a shabby chic paradise, and I am so honored to get to feature it today! 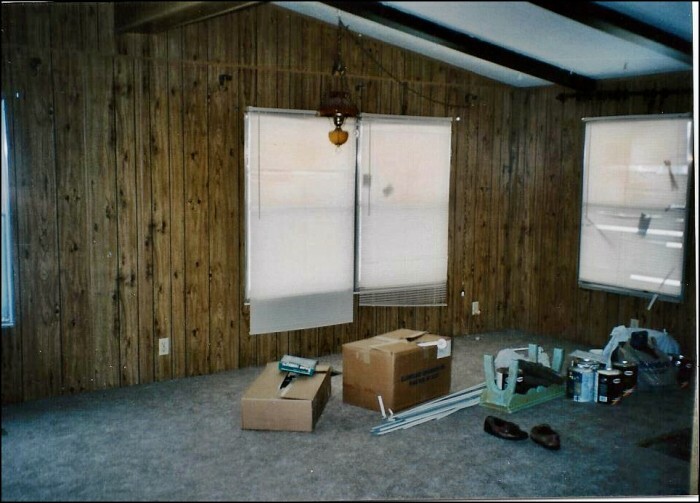 The home was a typical late 70’s double wide with wood paneling, semi-shag carpet, and cathedral ceilings with wooden beams that were so trendy in that era. The floor plan is well laid out, and the home is spacious. While it was a fine place to call home, Shannon was able to see the promise and potential. 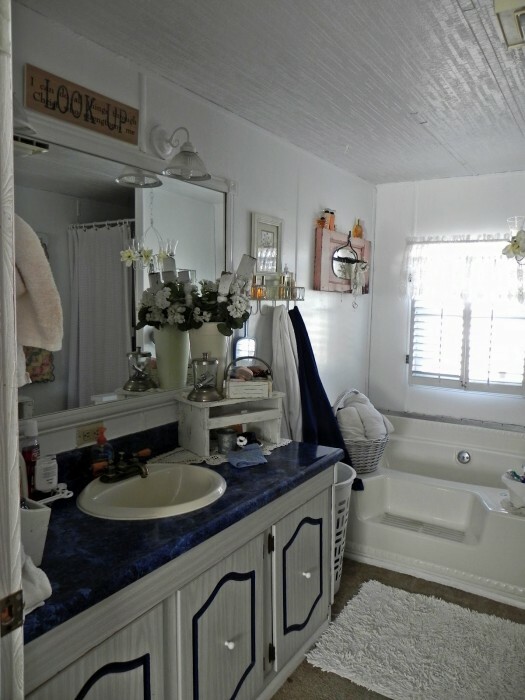 Her creativity and can-do attitude soared and she ended up with a double wide makeover that is fit for the cover of any home decor magazine out there. It’s a fresh country, shabby-chic blend, and it is gorgeous. Since this article’s publication we have been lucky enough to check in with Shannon again. 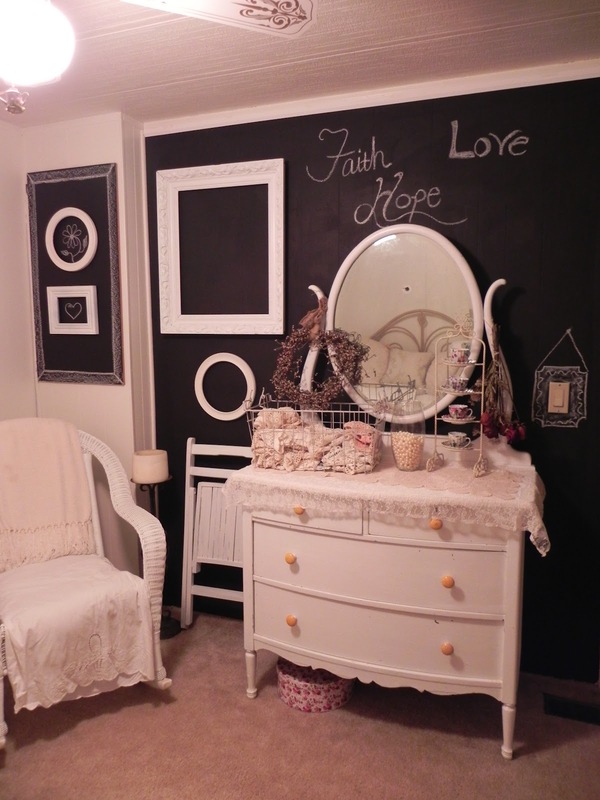 Be sure to check out her Shabby Chic Remodel Update. 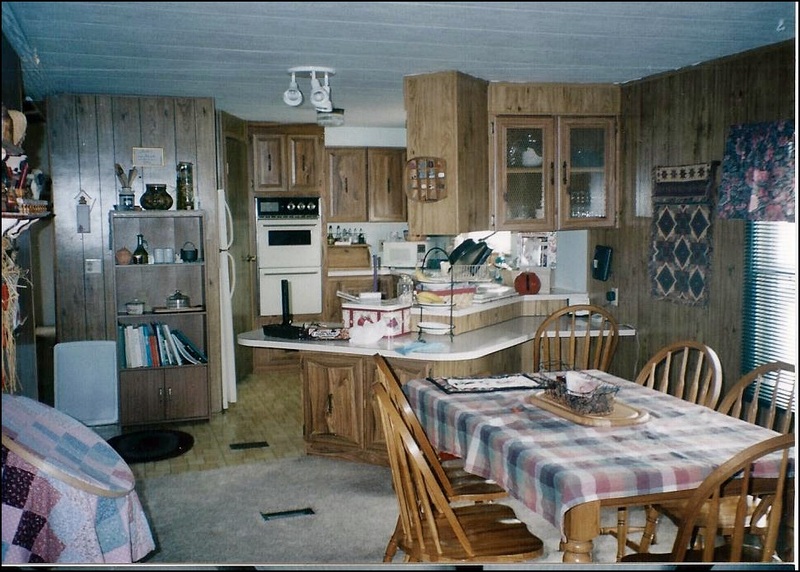 Kitchens with curved counters and plenty of storage space is a mark of the late 70’s manufactured homes. Regardless of the shape, kitchens are hard to makeover – there are so many different surfaces that must be considered in the overall design. 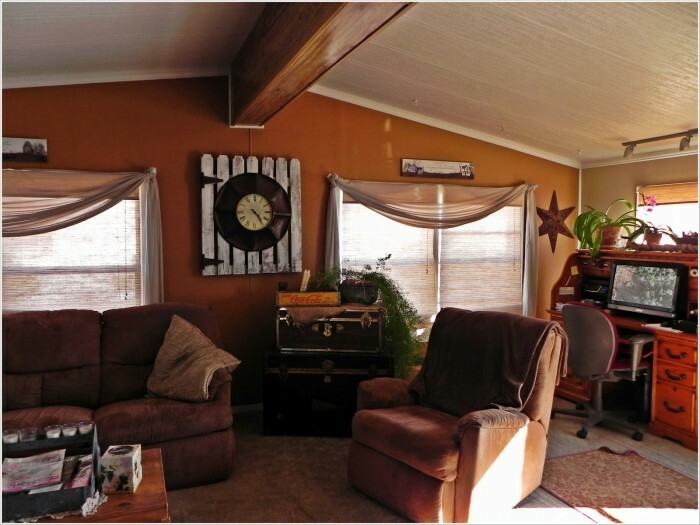 Fortunately, Shannon took on the double wide makeover with creativity and focus – the end result is amazing! 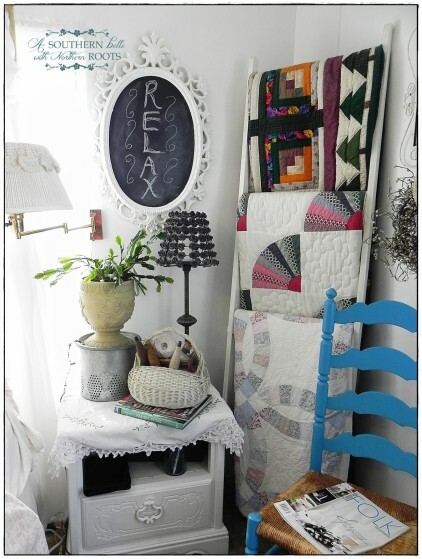 The style could best be described as country charming, flea market fabulous, and shabby chic. A white and cream base allows the warm oak trim and colorful tin tiles to make a statement. Distressing details throughout the room lends to the farmhouse look as well. Pops of color make a grand statement as well. The dining room extends from the kitchen in an open floor plan design. Did I mention how spacious the home is? The prominent feature of this room is the fireplace. Imagine getting to look at such a beautiful feature while cooking! 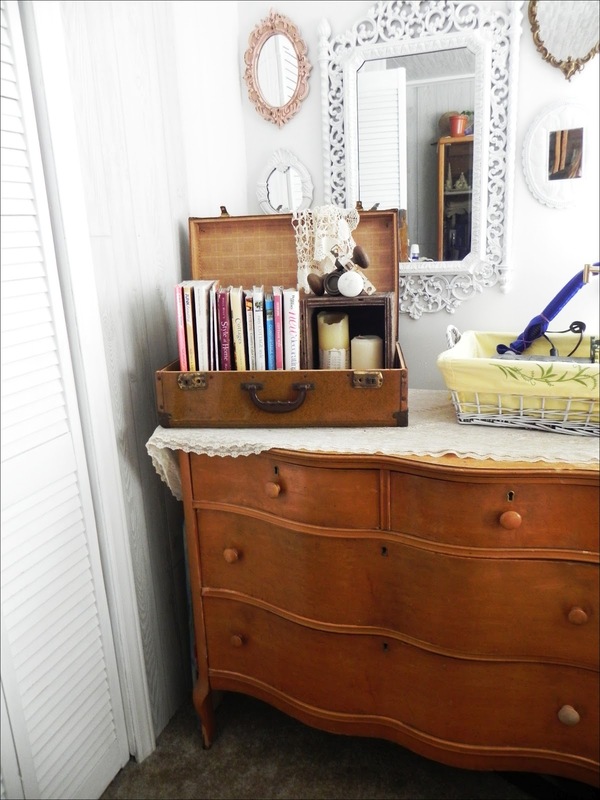 Shannon transformed a salvaged door into a shelf feature that holds her collection of antique scales. 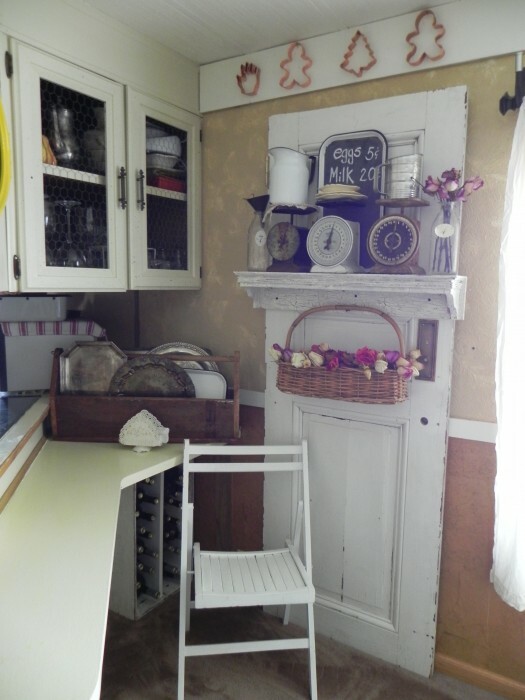 She removed the glass in the cabinets facing the dining room and replaced it with chicken wire. Smart storage solutions are used throughout the home. Here, the wine rack holds several bottles within a space that was previously unused. The small details in this house are remarkable! 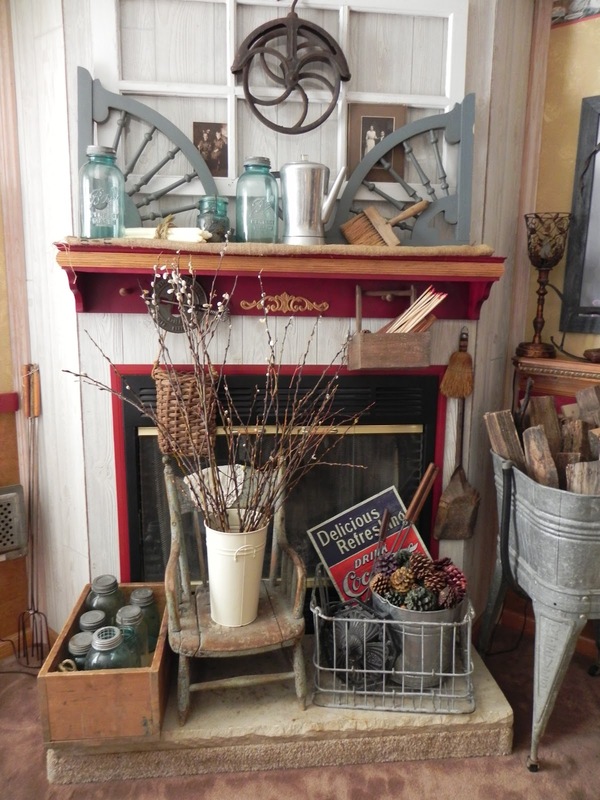 The fireplace is a gorgeous example of the country primitive style. 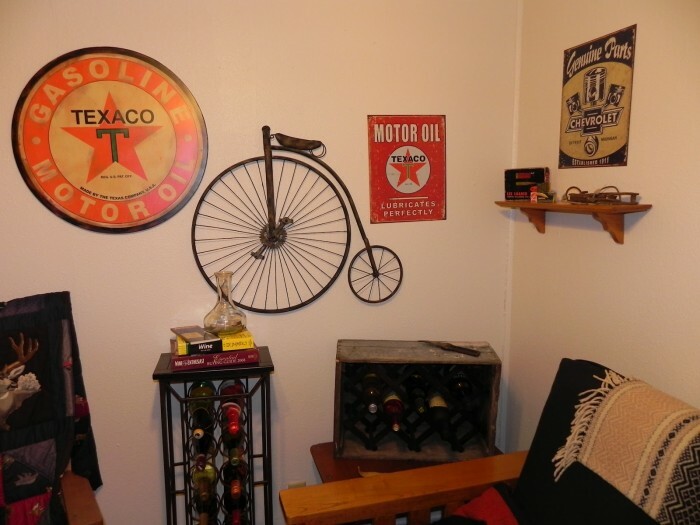 By grouping like items within a setting, you can make a large focal point that will pull the eye in. The living room has high cathedral ceilings that can make decorating difficult. Shannon pulled the makeover off like a pro. Removing the fake ‘wooden’ beams attached to the ceilings is a great idea to modernize a manufactured home. Most beams are usually just hollow 3 sided boxes attached to the ceiling with L-brackets that are used to cover up the seams. They have no structural integrity at all. The dark color and angled lines have a tendency to make the ceiling seem daunting and lower. Removing them is hard work but as you can see, the end result is well worth it. Shannon covered the old ceiling with new panels and trim. 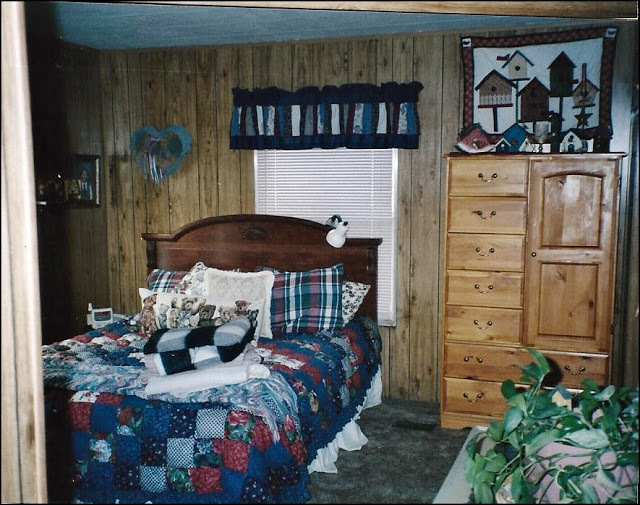 The master bedroom in this double wide manufactured home was outdated and dark. Shannon changed that quickly. The new master bedroom is a place of pure tranquility! The clean white of the walls matched with light linens and soothing decor makes this room a superb place to relax. Colorful details add a dramatic effect. 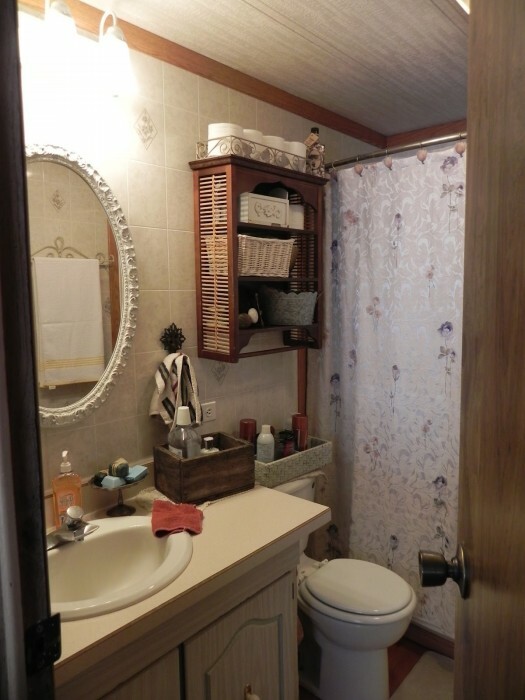 This double wide has 2 bathrooms and 2 bedrooms in addition to the master bedroom. Shannon’s children have grown and left the home so she turned one of the bedrooms into a man cave and the other into a beautiful guest bedroom. The second bedroom is a show-stopper! Black chalkboard paint is a perfect contrast to the crisp white walls and ceiling. The frames, the antique dresser, and the muted decor are a perfect combination! Before we close, I wanted to share one of Shannon’s projects. This is one of the most creative and easy ways to transform an interior door. 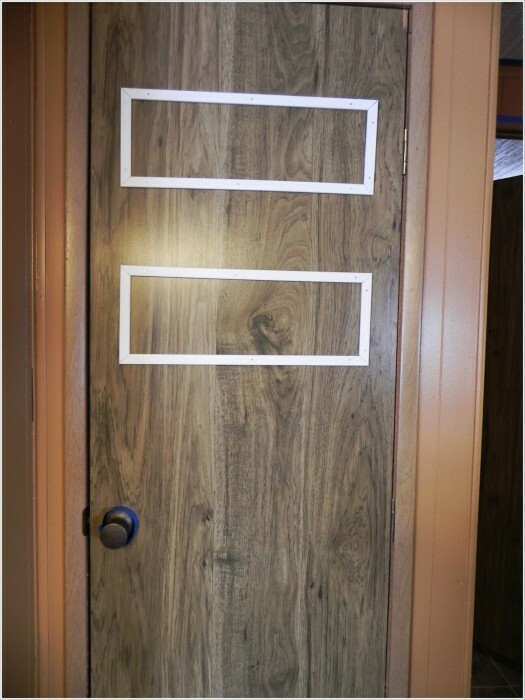 She took small trim and used it to create 2 rectangles on the top of the door and then painted over it. It instantly adds depth and makes a typical manufactured home interior door (that is usually hollow and unappealing) into a great feature. Shannon’s blog has many more details about the transformations. It covers home decor, gardening, scrapbooking and everything in between. She speaks honestly of the issues she encountered and the lessons she learned during her manufactured home transformation, too. 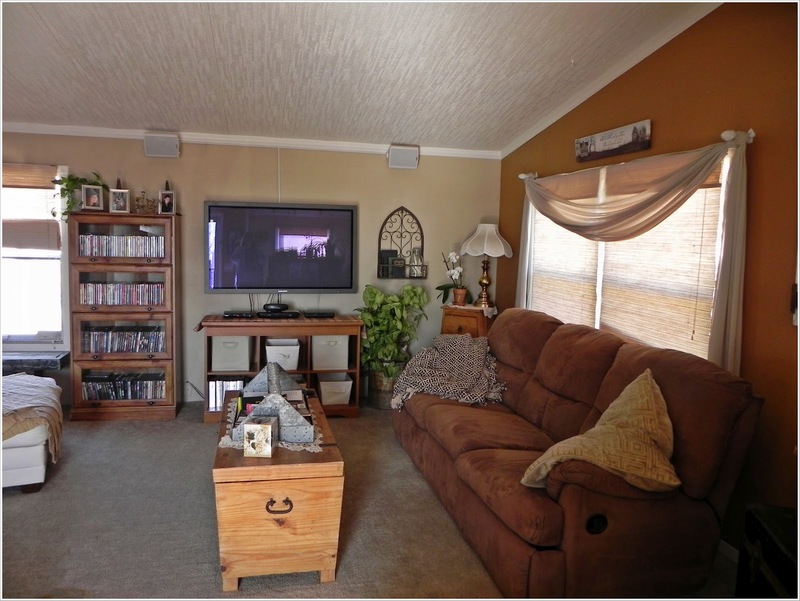 Shannon was kind enough to answer a few questions about this marvelous double wide makeover for us. Interviews are a great way to get insider tips and advice! In your opinion, what are the benefits and advantages of manufactured homes? The disadvantages? The benefits of mobile home living in our particular area are taxes. We pay a fraction of what even small homes pay in our community. I also like that we “split” the repair deal, so to speak. If a water main breaks it is the courts to fix, we just deal with what is above ground and in our home, a potential major expense. Disadvantages- repairs, often older homes used less than standard PVC, screws, and hardware, which can mean several trips to the hardware store. What was the most difficult issue you’ve faced during the makeover? Our most difficult issue was a slow water leak caused by a previous recall on some water tubing that had been used in most mobile homes. We didn’t live here when the recall happened and so we were unaware, after a long slow leak we smelled must, then rot and then the floor began to give way causing the washer and water heater to sink! It was major and even required having the entire heating/ air unit pulled since it was right next to the water heater! Expensive and time-consuming. 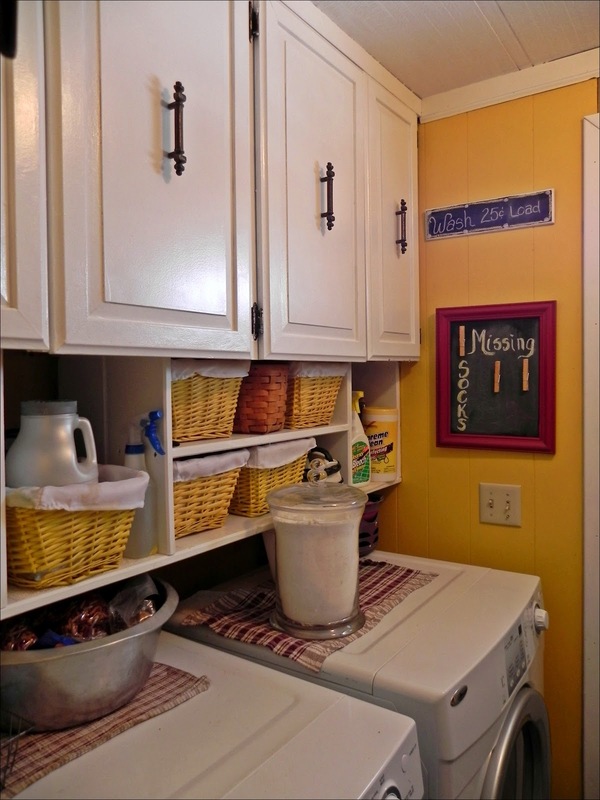 Shannon writes about the issue and the repair in a post called Laundry Room Redo. The room is cheerful, colorful and well organized. Check it out for some great tips! If you had to choose only 3 projects to transform a home what would they be? My top 3 home project transformations would be, make the kitchen fun to cook in, whatever that means, appliances that work or storage for your pots and pans- make your master bedroom a place of retreat and relaxation by using soothing color, and comfortable fabrics.- and…make your living room a place where people are comfortable and want to hang out. Have enough seating, throw some blankets around and have it livable, a place you can put your feet up and eat popcorn while watching the game or a movie. My favorite room is my bedroom, it is a refreshing restful burst every time I walk in it. The setting sun comes in the window casting a glow that says…stay, take a nap! 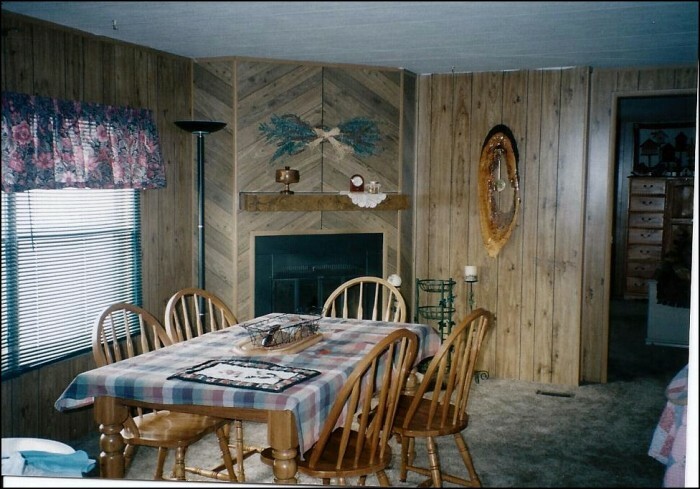 Any insider tips or tricks you can share about updating a manufactured home? Tips for updating manufactured homes would be, think outside the box. 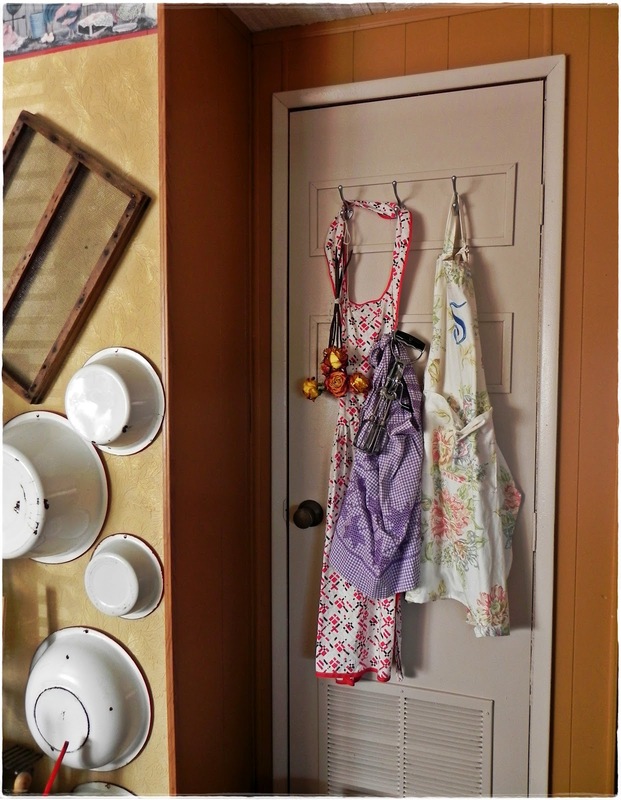 Use what you have and embellish, like the door I redid, a few pieces of wood and a coat of paint means a minimal cost and a minimal time investment. Use your room how you like, if you need the designated bedroom to be a family room, go for it! Paint, it is cheap and easily changed, paintable wallpaper is also a great idea, it helps you cover the unsightly seams of mobile home walls and not have the typical wallpaper look. I have used many different wall coverings from sheetrock to torn paper. How do you get ideas for your projects? I am always looking online at blogs and Pinterest for decorating ideas. I love magazines and have quite a collection, I would say my brain is saturated with ideas and occasionally one escapes! My tools are paint brushes, a good cordless drill and a bit that is square shaped to rid the home of those dumb square screws! What’s the best advice you can give to someone that’s about to tackle their first project? If you are about to tackle a project, spend a moment to plan, dive in wholeheartedly and be flexible. If something isn’t working…don’t give up. Make a party out of a project, throw something in the crockpot, turn up your favorite CD and hide the clock and your phone. Any future plans for the home? How would you describe what living in a manufactured home is like to someone that’s never been in or around one? 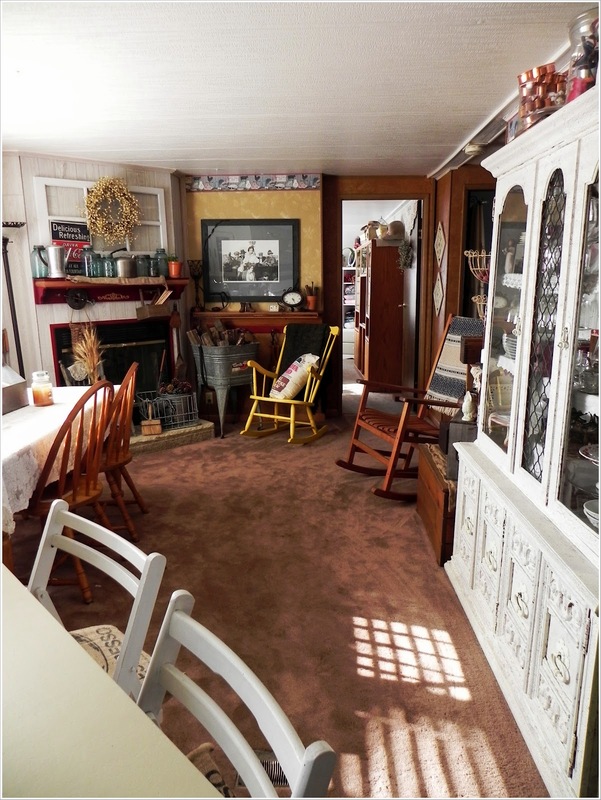 When we first moved into a mobile home I had never really been in many. I was worried it would be uneven or wobbly! Now, I rarely think I am in a mobile home…in fact, most people that read my blog never realize I am in one until I say something. A home is what you make it, I think our society has placed too much emphasis on size and features, typical homes have 3 car garages, oddly small bedrooms and huge ceilings. People are enslaved by house payments and taxes, I say…downsize and enjoy life a little more. Mobile homes are comfortable and cheaper, I say we beat back the stigma of living in the trailer hood and make our homes the most welcoming and comfortable place your friends have ever visited. You can follow Shannon on Pinterest, Facebook, Etsy, and HomeTalk. Thank you, Shannon, for allowing me to feature your wonderful home. It is a true inspiration! Hello! It is a beautiful home! You can see more of her home on her blog at http://www.asouthernbellewithnorthernroots.com/'s a great blog and there’s lots more photos and projects there! Thanks so much for reading and commenting. All look amazing. I love you designed it in a unique and beautiful way. I like all images but the kitchen images are incredible. Thanks to make this post so impressive. Another beautiful remodel…I'm so excited to see so many features on your blog. They never get old!